Bad Elf provides GPS information to popular aviation apps using a high quality 66 channel WAAS GPS. It works with all iOS devices such as iPad, iPhone and iPod Touch. Free Shipping! Just plug in your Bad Elf GPS and go play. No complicated setup. No batteries to charge. No hassles. Bad Elf simply plugs into the bottom of the iPad or iPhone and includes a USB port which can be used to sync and charge the iPad or iPhone. Furnished with a detachable lanyard. 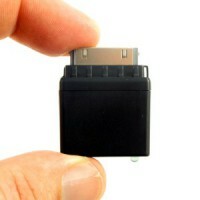 Compatible with iPad 1 and 2, iPhone 3G, 3GS, 4GS, and iPod Touch 1G-4G. Made for every iOS device. The Bad Elf GPS is the best selling Apple approved external GPS accessory designed to directly connect to your iPad, iPod touch and iPhone. The Bad Elf GPS accessory plugs into the dock connector and allows Apps to read your current location. To simplify your search for great Apps, we’ve categorized many Apps that we know work well with a Bad Elf GPS by your favorite activities.